Outstanding Crochet: Scarf - transformer "Sciarpone". Pattern. 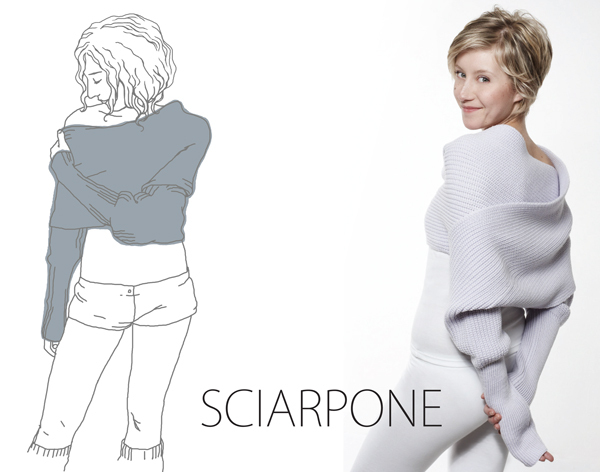 Scarf - transformer "Sciarpone". Pattern. we have to count, may be add some stitches. Anyways, we have to make a sample first. Row 1 (Wrong Side): * purl(p1), knit(k1); rep. from * to last until you get to desired width of your scarf, p1. Row 2 (Right Side): Slip 1st as knit,*slip stitch as if to purl alone with a loop, k1*; rep from * to * to the end. Row 3: Slip 1st as purl, *k1, p1*; rep from * to* to the end. Repeat Rows 2 and 3 until you get to the point to start another sleeve. Decrease some stitches (as many as we added after first sleeve. Sorry, I didn't count number of stitches, it depends on yarn. I would take fine yarn since this pattern turns out really thick. I really want to make this for my mom but I am new to knitting. Is there any help you can give me on how to make this? I am not sure how to make sleeves and I don't understand the instructions for rows 2 and 3. Any help at all would be great, thanks! Wonderful!! Thank you for the free pattern!